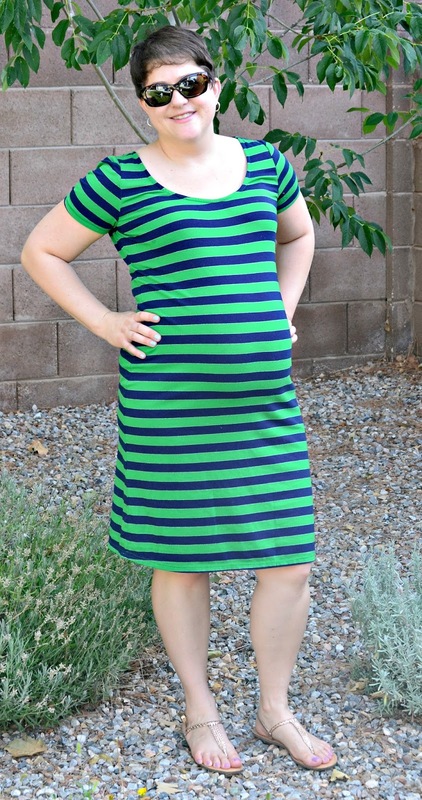 Another quick and easy maternity dress! This time I used McCalls 6612- NOT a maternity pattern. However, because this is a knit dress, it accommodated my swelling bump without adjustments. I used a blue and green jersey I purchased at Joann Fabrics earlier in the Spring. You can't see it very well in the photo but there is a thin metallic thread running between each stripe which is a nice touch. I spent $22 on fabric. When sewing garments made for knits with the Big 4, I usually go with 2 sizes smaller than what is recommended by the envelope. However, I only sized down by 1 size below my PRE-pregnant measurements and this worked out well. The dress is fast and easy. I finished the neckline with seam binding- which was the only change I made. I am really happy with this dress. It is comfortable and easy to wear- yet you still look a little more dressed up than typical maternity casual RTW. When I wore this out the first time, I received several compliments from friends. I was also stopped by a stranger who told me she was looking for cute maternity wear but couldn't find anything and wanted to know where I got my dress from! Another plus is that this will still work next year when I'm not pregnant! Cute dress Jenny! I just finished a striped shift dress myself.. I'm behind on blogs by about 6 months so I missed that you are preg again. Congratulations!